Tara makes some great recommendations for garnishes that make this dish really beautiful and add interesting layers of flavor; if you don’t have any of these on hand, a simple drizzling of olive oil or sesame oil and toasted sesame seeds will be a really good start. Garnish options: coriander or cumin seeds (toasted), ground sumac or za'atar, toasted sesame seeds or pine nuts, minced flat-leaf parsley and chives, assorted sprouts, or fried shallots. In a food processor fitted with the metal blade, add the almond meal and chickpeas and run the machine, stopping and scraping down the sides occasionally, until the beans are crumbly and light. Pour in the tahini, miso, garlic, red pepper flakes, lemon juice, and preserved lemon. Blend again for 2 minutes or so, then scrape down the sides of the machine. Switch on the motor and start drizzling in enough water, slowly, so that the hummus billows up, aerated and fluffy. Depending on the beans, you may not use all the water, or you might need more. Let the machine run for about 2 minutes, or until the consistency is nice and smooth. Taste and check for seasoning; add salt and pepper if you’d like. For a roasted accent, drizzle in some toasted sesame oil. 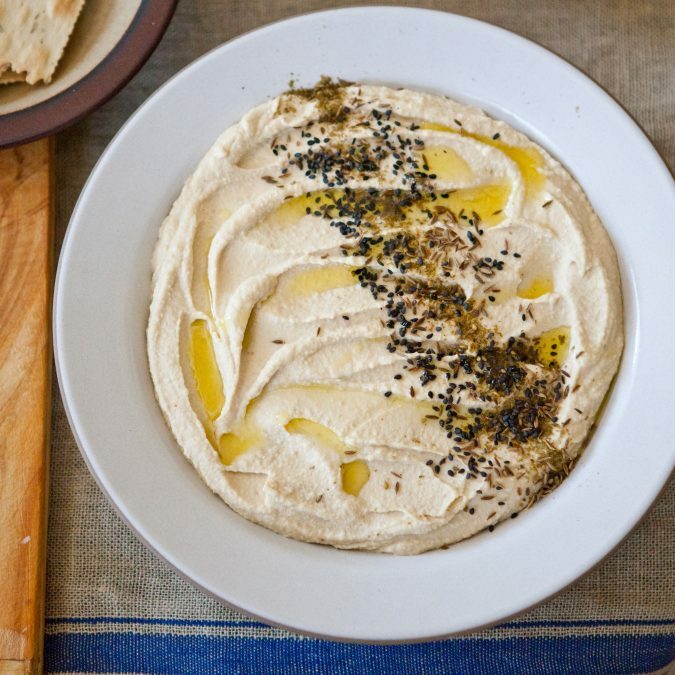 Let the hummus sit for 30 minutes at room temperature before serving, or refrigerate in a covered container for up to 3 days. Serve with your choice of garnishes.